Creeks are of economic importance in Niger Delta region of Nigeria, they are used for various human activities including fishing, and other domestic purposes. A creek is a shallow expanse of water with restricted circulation in a micro tidal environment (Lawson, 2011). This aquatic resource of multiple usages receives input of domestic and industrial waste waters, petroleum hydrocarbons, and emission from automobile exhaust (Orhibabor and Ogbeibu, 2009). Major problems of pollution, contamination and toxicity are associated with aquatic ecosystem. Water, be it a river or lake system or any other natural surface water can be divided into two phases: an aqueous phase consisting of water with or without dissolved salts and a solid consisting of sediment and suspended particulates (Adoki and Orugbani, 2007). The fact is that whatever gets into an aquatic environment does not only reach the water column, but as well gets to the sediment. This is the case with aquatic pollutants, toxicants and contaminants. Several studies have indicated that highly toxic heavy metals and organometals are common contaminants of natural water (Okafor and Opuene 2000; Ayejuyo et al., 2005; Azim et al., 2006). Sources of these substances according to Abowei (2010) include industrial and domestic waste water, atmospheric deposition erosion, and even direct application, such as pesticides. More research on the pollutants of aquatic environment revealed that the concentration of heavy metal ions in the aqueous phase are usually of the mgml-1 level whereas the metal concentrations in the sediments are at ppm level (Gobo et al., 2008). The authors further implied that the sediment provided the main sink for heavy metal in the aquatic environment. Heavy metals discharge into the environment rapidly associates with particulates and ultimately settles in bottom sediments of water bodies either through direct discharge or surface run off (Makinde et al., 2015). The accumulation of metals from the overlying water to the sediment is dependent on a number of external environmental factors such as pH, electrical conductivity and the available surface area for adsorption caused by the variation in size distribution. Digenetic processes in the sediments can change and redistribute these contaminants between the solid and the dissolved phases, but most of the elemental contaminants are immobilized through sedimentation (Ni et al., 2005), which further affects the aquatic organism such as crabs. Callinectes amnicola specie of crab belongs to the family portunidae. It distributed in almost all fresh water, near the shore, rivers and marine environment. Crabs being in contact with water bodies, must have received wastes and possibly harbouring some toxicants, especially heavy metals. Many commercial species and food chain organizations spend a major part of their life cycles living in water or on aquatic sediments, thereby providing a pathway for these contaminants to be consumed by higher aquatic life and humans (Calmano et al, 1996). The monitoring of heavy metals in marine organism is of great importance for protection of the public from hazard of possible toxic effects. Heavy metals suppress the immune system, leading to major disease in aquatic organism (Sengupta, 2002). Thus, this research work examined the concentration level of some selected heavy metals (Lead, Cadmium, and Iron) in sediment, water and tissue of swimming crab Callinectes amnicola, from Bodo creek, Niger Delta. Bodo creek is situated at Latitude 04°36′ N East and Longitude 7°15′ E in Gokana Local Government Area of Rivers State, Nigeria. Bodo Creek is a network of creeks and creek- lets on the upper reaches of the Andoni-Bonny river system (Plate 1). The creek adjoins Bodo community, administratively located in the Gokana local government area of Rivers State, Nigeria (Figure 1). The creek structure and pattern of hydrology have been described by Zabbey (2012). Traditionally, Bodo Creek is a strong livelihood support base for the people of the Bodo community and their neighbours. The creek provides readily incentives for fishing, transportation, cassava fermentation, fuel wood production, domestic waste disposal, small-scale aquaculture and sand dredging (Zabbey, 2012). Access to bio-resources within Bodo Creek is open to every person including migrant fisher folks. The creek has been subjected to intense oil pollutions in recent times (Plate 2). There are no organized management structures in place to check and regulate exploitation rates in the creek basin beyond weak community imposed regulations, which are grossly violated due to lack of enforcement. Three sampling stations of 200km apart were identified in the creek. Plate 1: Bodo Creek before the Oil Spill (2008). Figure 1: Map of the Study Site (Bodo Creek) Showing the Three (3) Sampling Stations. 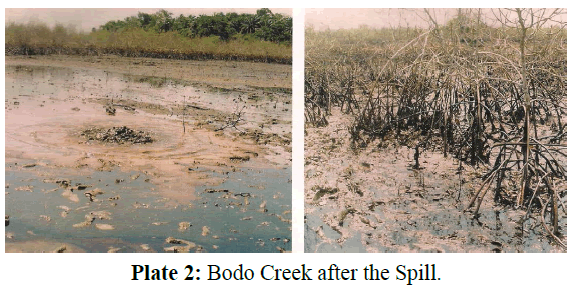 Plate 2: Bodo Creek after the Spill. Crabs (Callinectes amnicola) of different sizes (Plate 3 and 4) were collected from Three (3) locations of the Bodo Creek. The sample collection was carried out from November 2014 to January 2015. The crabs were caught using drag net. The Specimens collected in the field were preserved in an ice-chest before it was transferred to the laboratory where it was refrigerated to preserve their freshness before analysis. Each Crab was properly cleaned by rinsing with distilled water to remove debris, planktons and other external adherent and then dissected for collection of tissues hepatopancreas, muscle and exoskeleton prior to analysis. Also, Sediments were collected from Three (3) locations of the Bodo Creek, with the use of plastic container and kept in a foil paper, before transferring to laboratory for analysis. Water sample from the surface was collected from Three (3) locations of the Bodo Creek in a pre-cleaned plastic bottle, which was checked at insitu using a multimetre for accurate result. The physicochemical parameters such as pH, Dissolved Oxygen, Conductivity, Temperature, Salinity and TDS were checked at in-situ. Plate 3: The dorsal and ventral view of Male Callinectes amnicola. Plate 4: The dorsal and ventral view of female Callinectes amnicola. Samples of crab Callinectes amnicola were rinsed with distilled water to remove debris, plankton and other external adherents. They were then dried in an oven at 105ºC. They were later homogenized using mortar and pestle. 10 g of the homogenate was digested as described by APHA (1998). The sample was digested using 1:5:1 mixture of 70% perchloric acid, concentrated nitric acid and sulphuric acid at 80ºC in a fume chamber until a colourless liquid was obtained. The metal concentrations were determined by Atomic Absorption spectrophotometry buck scientific 200A model. This involved direct Aspiration of the sample into an air/ acetylene or nitrous oxide/acetylene flame generated by a hollow cathode lamp at a specific wavelength peculiar only to the metal programmed for analysis. For every metal investigated, standards and blanks were prepared and used for calibration before samples were aspirated. Concentrations at specific absorbance displayed on the data system monitor for printing. Limit of detection is <0.001 mg/l. Levels of heavy metals were expressed in mg/L dry weight. Water sample from the surface was collected from Three (3) locations of the Bodo Creek in a pre-cleaned plastic bottle, which was checked at in-situ using a multimetre for accurate result. The physicochemical parameters such as pH, Dissolved Oxygen, Temperature, were checked at in-situ using a multi meter, While Salinity Conductivity, and TDS were determined using a method of APHA (1998). The data obtained from this work was analyzed using one-way analysis of variance (ANOVA). The result of the variations in the concentration of heavy metals in the sediment from Bodo Creek obtained from the three Stations is presented in Table 1. These heavy metals were present in the sediment at varying concentrations. The order of abundance of these metals in the sediments of the Three stations were Fe>Cd>Pb (Table 1). Fe attained its highest value at station 3 followed by station 2 while its lowest was observed at station 1. The highest for Cd and Pb were recorded at station 1 and station 3 respectively, while their lowest was recorded at station 2. However Fe and Cd was significantly different across the three stations while Pb has no significant different across the three stations. Comparing the present results with the WHO standards, it is obvious that the concentration of the metals (Fe, Pb, and Cd) in the sediments is hazardous to health as it exceeds permissible limits. Table 1: Variation in the Concentration of Heavy metals in the Sediment. The variation in the concentration of Heavy metal of Bodo Creek water through the different stations is presented in Table 2. From the result (Table 2), there is a notable existence of the studied heavy metals (Fe, Cd, Pb) in Bodo Creek Water. The mean value for Fe ranges 1.30 ± 0.19, 1.40 ± 0.18 and 0.56 ± 0.07 across the three sampling stations respectively and Pb ranges 1.63 ± 0.37, 1.33 ± 0.17 and 1.03 ± 0.15 while Cd ranges 0.03 ± 0.00, 0.06 ± 0.00 and 0.03 ± 0.00 across the three sampling points. Therefore, Fe, Pb and Cd have significant difference across the three stations (P<0.05). Thus, comparing the concentration of these Heavy metals in Bodo creek water with the WHO standard, it shows that Fe and Pb are higher than the permissible limits as such are toxic to the environment while Cd falls within the limit recommended by World Health Organization. Table 2: Variation in the concentration of Heavy metal of Bodo Creek water across the different stations. Result of the physicochemical parameters of Bodo Creek Water across the different stations is presented in Table 3. All the physicochemical parameters showed there is no significant difference except Temperature and BOD that has statistical significant as P<0.05 (Table 3). Table 3: Variation in the Concentration of physicochemical Parameters of Bodo Creek Water across the Stations. Temperature ranged between 30.53 ± 0.26, 30.07 ± 0.47, 31.63 ± 0.27) across the stations with its peak at station 3 while the least was recorded at station 2. The hydrogen ion concentration of pH was acidic. The pH ranged was 6.60 ± 0.12, 6.23 ± 0.15 and 6.43 ± 0.09 across the sampling stations. Thus, it was highest at station 1, lower at station 3 and least at station 2. The Salinity of the Bodo Creek water showed it is a brackish water environment. It ranged from 11.57 ± 1.19, 11.47 ± 0.49, 10.18 ± 0.45 across the three stations. The mean values of the dissolved oxygen 1.17 ± 0.45, 2.53 ± 0.52, 2.03 ± 0.09, were recorded across the sampling points. However there was no significant different across the three stations (Table 3). The mean values for conductivity and TDS were high at station 1 and 2 but low at station 3 and they were no significant difference across each of the sampling points. Comparing the physicochemical parameter with the WHO standards, the values of the pH and dissolved oxygen fell within the acceptable levels for survival, metabolism and physiology of aquatic organisms. However temperature fell above the permissible limits as temperature over 30°C can cause regression in growth and decay in plants. In station 1 (Table 4) the Fe concentration tends to be higher in the Carapace (1285.68 ± 85.69) followed by the Muscle (138.73 ± 1981), Gill (1033.25 ± 33.25) and leg (68.27 ± 4.00). Pb has it peak at the Leg (1.13 ± 0.09), followed by muscle (0.62 ± 0.02), Carapace (0.47 ± 0.20) and Gill (0.42 ± 0.02) while Cd ranges from its highest being the Carapace (2.40 ± 0.26) followed by Leg (0.43 ± 0.13), Gill (0.38 ± 0.44) and it’s lowest to be Muscle (0.03 ± 0.03). In station 2 (Table 5) the concentration on Fe was at peak at the Gill (318.73 ± 33.16), Leg (182.35 ± 16.20), Carapace (161.90 ± 1.90) and Muscle (101.08 ± 0.95). Pb has it highest value at the Gill (0.70 ± 0.10), Leg (0.30 ± 0.25), while the Carapace and Muscle had no concentration of Pb, while Cd is high at the Leg (2.81 ± 0.16), followed by Carapace (2.40 ± 0.26), Gill (2.02 ± 0.02) and muscle (1.13 ± 1.19). Table 4: Variation in the Concentration of Heavy metal in the Crab at Station 1. Table 5: Variation in the Concentration of Heavy metal in the Crab at Station 2. In station 3 (Table 6) shows that Fe concentration is most at the Gill (1440.02 ± 30.57), followed by Carapace (771.68 ± 34.86), Leg (475.31 ± 6.05) and muscle (48.77 ± 1.49) and Pb occurred only at the Leg (0.33 ± 0.33). While Cd concentration in the Crab occurred most at the carapace (5.43 ± 0.31), Leg (3.78 ± 0.14) and least the Gill (1.48 ± 0.27) as Cd was not detected in the muscle of the Crab. Comparing the concentration value of the metals in the Crab across the three stations shows that Fe, Pb and Cd highly exceeds the permissible limit. However, Pb in station 2 (Carapace and Muscle) and station 3 (Carapace, Muscle, Gill) shows no level of concentration, similarly with Cd in Station 3 (Muscle) shows no concentration. Thus, the concentration of metals in the edible studied parts of the crab in the Bodo creek water is not safe for consumption as it pose a health risk to the consumer. The concentration of Heavy metal on some part of the crab was analyzed (Table 4). Table 6: Variation in the Concentration of Heavy metal in the Crab at Station 3. The bioaccumulation of the heavy metals (Fe, Pb and Cd) in Bodo creek water in the three sampling points was compared using World Health Organization standard (Manoj and Avinash 2012). The obtained results showed that the heavy metals (Fe, Pb and Cd) concentration in the sediment, exceeds the WHO permissible limits (Table 1) while in the water (Table 2) the results showed that, with the exception of Fe and Pb, the heavy metal (Cd) concentration in water did not exceed WHO permissible limits. The sediment accumulated more heavy metals than the water in this study as have been observed by Fabris et al. (1994), Lau et al. (1998), Chindah and Braide (2003) and Eja et al. (2003). Sediment is the major depository of metals in some cases, holding more than 99% of total amount of a metal present in the aquatic system (Odiete, 1999). The observed low concentration Cd in the Bodo creek water, in this present work is contrary to the report of Charity (2014) who observed higher values of Cd in sediment in this aquatic environment (Bodo creek). The near uniformity of the physicochemical parameters such as temperature, salinity, pH, and DO among the three stations was attributed to the tidal nature of the study area. Tidal fluxes encourage back and forth missing the creek waters. Zabbey (2012) studied the spatio-temporal variability in water quality of Bodo Creek and noted the influence of tidal fluxes and local weather conditions on the physic chemistry dynamics of the water. The heavy metals (Fe, Pb, and Cd) investigated were detected in all stations studied, though at varying concentrations. This could be because of industrial and human activities taking place at those locations (Ashraj, 2005). The concentration of the heavy metals (Fe, Pb, and Cd) in the Leg, Carapace, Muscle, and Gill of the crab (Callinectes amnicola) exceeded the WHO permissible limit. Pb in station 2 (Carapace and Muscle) and station 3 (Carapace, Muscle, Gill) shows no level of concentration, similarly with Cd in Station 3 (Muscle) shows no concentration. The studied heavy metals order of abundance in the crab (Callinectes amnicola) is Fe>Cd>Pb. This agrees with the report that Fe, Pb, and Cd are some of the poisonous persistent toxic metal known (Akinrotimi et al., 2015). It was observed that the studied parts of the crab (Callinectes amnicola) showed more accumulation of Fe and Cd. The highest level obtained was that of Fe in the Carapace of the Crab at station 1. Farombi et al. (2007) have also reported that Fe, Pb and Cd are major heavy metals associated with Nigerian crude oils. Also antifouling paints used to prevent growth of marine organism on boats contain Pb as an important component. Such paints constantly leach toxic metal which ultimately transported to the sediment (Bryan et al., 2012). This work has shown that there is serious heavy metal pollution in this creek (Bodo). The bioaccumulation patterns of metals in the studied parts of the crab can be utilized as effective indicators of environmental metal contamination as suggested by Lawson (2011). This study shows that the crab concentrate high levels of heavy metals as such indiscriminate effluents discharges should be stopped or effluent must be treated before being released into this creek (Bodo). Also there should be continuous environmental pollution monitoring to check heavy metals hazard. The study has shown that the crab (Callinectes amnicola) has a high bioaccumulation of the studied heavy metals (Fe, Pb, and Cd) as the concentration level on the studied parts of occurrence exceeds the recommended limits. Also, it has shown that heavy metal contents of the Bodo creek water, sediment and physicochemical parameters (except pH) exceed the recommended limits. It is therefore recommended that the studied site (Bodo Creek) be totally cleaned and water treated as crab or other aquatic organisms in Bodo water may be hazardous to consumers. Crab from these stations should be processed properly before consumption. Abowei, J.F.N. (2010) Salinity, dissolved oxygen, pH and surface water temperature conditions in Nkoro River, Niger Delta, Nigeria. Adv J Food SciTechnol2, 16-21. Adoki, A., Orugbani, T. (2007) Influence of nitrogenous fertilizer plant effluents on growth of selected farm crops in soils polluted with crude petroleum hydrocarbons.African Journal Agriculture Research 2, 569-73. Ashraj, W. (2005) Accumulation of heavy metals in kidney and heart tissues of Epinephelusmicrodon fish from the Arabian Gulf. Environment Monitoring Assess 101, 311-316. Akinrotimi, O.A., Edun, O.M., Makinde, O.O. (2015) Seasonal variation of heavy metals in selected sea foods from Buguma and Ekerekana creeks, Niger delta. 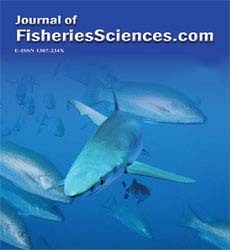 International Journal of Innovative Studies in Aquatic Biology and Fisheries 1, 46-53. APHA. (1998) Standard Methods for the Examination of Water and wastewater. 20th ed. American Public Health Association, New York, USA. 1218. Ayejuyo, O.O., Raimi, O.G., Moisili, O.R. (2005) Determination of trace metals in Silver Cat Fish (Chryssichthysnigrodigitatus), associated water and soil sediment from Beach line Fish Ponds. Pak J Science Industry Research Journal 48, 39-41. Azim, A.A., Daneshmad, T.N., Pardakhti, A. (2006) Cadmium absorption and accumulation in different parts of kidney beans, radishes, and pumpkins. International Journal of Environment Science and Technology 3, 177-180. Bryan, G.W., Waldichuk, R. J., Ann, D. (2012) Bioaccumulation of Marine Pollutants and Discussion. Philosophical Transactions of the Royal Society of London.Series B, Biological Sciences. Calmano, W., Ahif, W., Forstner, U. (1996) Sediment quality assessment: Chemical and biological approaches. Sediment and toxic substances.Springer, 1-34pp. Charity, ASSO. (2014) Studies Of Bioaccumulation Of Heavy Metals In Tiger Shrimp Penaeusmonodon in Bodo creek. Project submitted to the UNIPORT. PH. Rivers State, 40. Chindah, A.C, Braide, S.A. (2003) Cadmium and Lead concentrations in fish species of a brackish wetland / upper Bonny Estuary, Niger Delta. J. Nig. Environ. Soc. (JNES) 1, 399-405. Eja ME, Ogri ORA, Arikpo GE, (2003).Bioconcentration of heavy metals in surface sediments from the Great kwa Rivers Estuary, Calabar, South Eastern Nig. J. Nig. Environ. Soc2, 247-256. Fabris, J.G., Richardson, B. J., O’Sullivan J. F., Brown, F.C. (1994) Estimation of Cadmium, Lead and Mercury concentration in estuarine waters using the Mussel Mytilusedulisplanutatus L. Environ. Toxical. Water quality 9, 183-192. Farombi, E.O., Adelowo, O.A., Ajimoko, Y.R. (2007) Biomarkers of oxidative stress and heavy metal levels as indicators of environmental pollution in African Cat fish (Clariasgariepinus) from Nigeria Ogun River. International Journal Environment Research Public Health 4, 158-165. Gobo, A.E., Ubong, I. U., Ede, P.N. (2008) Rainfall intensity as a tool for hydrological and agricultural in Southern Nigeria.International Journal.Meterology33, 343-50. Lawson, E.O. (2011)Physico-Chemical Parameters and Heavy Metal Contents of Water from the Mangrove Swamps of Lagos Lagoon, Lagos, Nigeria. Advances in Biological Research 5,08-21. Lau S., Mohammed, M., Tanchi, Y.A., Suut, S. (1998) Accumulation of heavy metals in freshwater mollusks. The Science of the Total Environment 214, 113-121. Manoj, K., Avinash, P. (2012)A review of permissible limits of drinking water. Indian Journal Occupational Environment Med 16,40-44. Makinde, O.O., Edun, O.M., Akinrotimi, O.A. (2015) Comparative Assessment of Physical and Chemical Characteristics of water in Ekerekana and Buguma Creeks, Niger Delta, Nigeria. Journal of Environmental Protection and Sustainable Development 1, 66-73. Ni, I. H., Chan, S.M, Wang, W.X. (2005) Influences of salinity on the biokinetics of Cd, Se, and Zn in the intertidal mudskipper Periophthalmuscontonensis. Chemosphere 61, 1607-1617. Odiete, W.O. (1999) Environmental Physiology of animals and pollution Diversified resources Ltd Lagos, 261pp. Orhibhabor, B.J., Ogbeibu, A.E. (2009) Concentrations of heavy metals in a Niger Delta mangrove creek, Nigeria. Global Journal of Environmental Sciences 8, 1-10. Sengupta, A.K. (2002) Principles of Heavy Metals Separation: Environmental Separation of Heavy Metals: Engineering Processes. 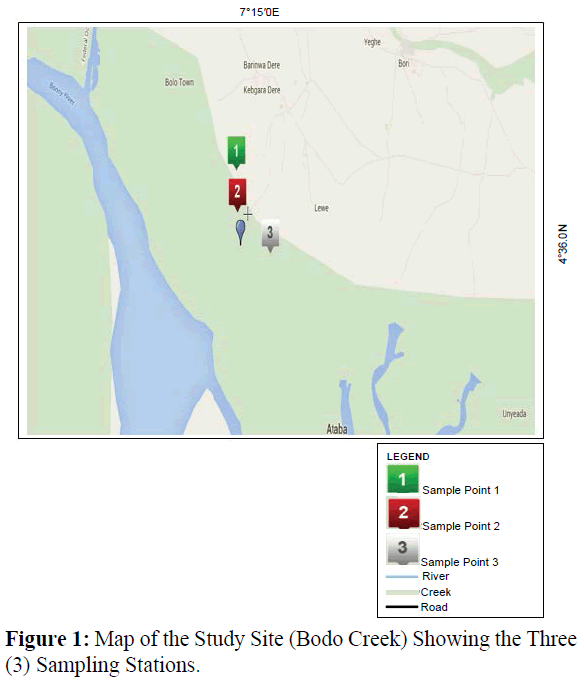 Zabbey, N. (2012) Spatial and temporal variability in interstitial water quality of soft-bottom flats at Bodo Creek, Eastern lower Niger Delta, Nigeria. Trop. Freshw. Biol21,83-103.